I've dreamed about this for years. 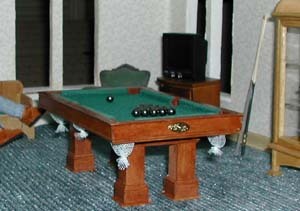 A pool table in my dollhouse. I thought, I planned, I envisioned, I searched and finally, I have one. Did I buy it from a famous artisan? Did I buy the cheapy mass produced one? Nope. I decided I'd make it myself. And to my surpise, I did! I did research, of course. 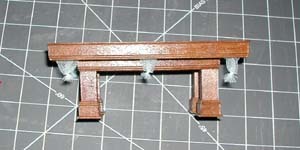 I altered it a bit and adjusted some measurements so it would fit in my dollhouse. 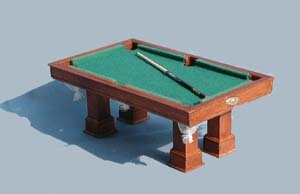 Bestbilliards.com had instructions for building a life size pool table. There were no exact instructions, but I was able to tune in to the idea. This is one of my obsessive projects - I could not do anything else until I finished it! Fortunately, I had all of the materials on hand. This pool table is no longer in my possession! I donated it to an arts fundraiser auction. It went for $34.00 (so I heard!) so I'm glad at least expenses were covered, and the Arts Council got a little money. I only know the proud new owner lives in McLean. I sincerely hope that it's well taken care of! 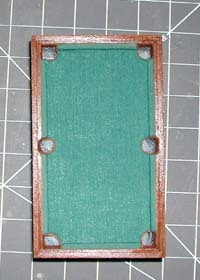 Check out my Tutorial on how to make a pool table! I made this light after someone asked me about making pool table lights. 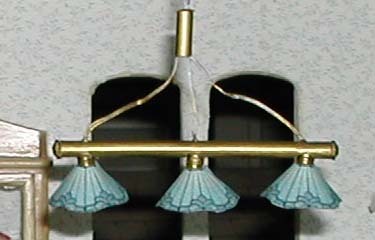 The tubing is a plastic straw painted gold, the "stained glass" shade is paper. I have no idea how long these materials will survive being this close to the bulb, which seems to heat up. This is the pattern I made up.